Many people approach "hooping" with the main goal of keeping the hoop moving and not dropping it. "Hoopment" with mini-hoops provides a different approach--instead of being focused on keeping the hoops moving, our focus is moving around the hoops. The nature of the hoop is to spin, when force is applied. When we slowly allow the hoops to move us, they guide us through the planes that the hoops help us perceive: through their flatness, paired with the roundness; that helps to guide our joints through a circular range of motion. If we keep our focus on keeping the hoops on a vertical (vs. a horizontal) plane, they guide our arms and bodies to move through those same vertical planes. The hoops can only move in two directions, so the key becomes moving our bodies around the hoops. Move the hoop(s) slowly vs. quickly, so the body's stabilizer muscles get the opportunity to engage, as well as gently stretch the fascia and muscles; while warming up the ground substance in between the tissues, causing it to move more fluidly, so the body may move with greater ease and grace. Speed up and slow down. Feel the differences in flow. By closing our eyes, while we practice allowing the hoops to move us, we may get a better sense of spatial awareness. Initially begin by lightly scraping the hoop(s) across/around one's body; with a loose enough grip that the hoop(s) can flip or flop as they may, while still maintaining a fairly stationary hold. Enough slack for it to move, enough grip to keep a light hold on it. The hoop is not spinning because we are applying force to it, and letting it go, as in traditional hooping. When the hoop is turning, it's because the hand/body is moving it--essentially, the hoop remains "stationary" as we move around it. Get a sense of your core, your center. Then expand out (making sure you have enough space) with your arms; the hoops then give you a sense of your "sphere". Contract and expand within that sphere. Let the hoops move as they may, and enjoy how good it feels to move your body in all the different ways the hoops guide you to move, safely and gently. Don't think about it too much. Just feel it. Stretch, meditate, strengthen your core, and increase spatial awareness, any place that there's enough space for Hoopment. Not much space is required when we keep our hoop(s) close to our center. Be aware of your sphere. Maintain your place in space. Give it a go, anywhere you go. The worst anyone may do is ask you to stop. And that's ok. Pretty soon you'll be somewhere else where the space will allow you to practice allowing the hoop to move you. Check out the following videos if you would like some guidance. There are a total of five basic lessons; which may be enough direction to get you moving and playing in your own way. Or just play with the hoop and see how it moves you. Explore! Do what feels good to your tissues. Like life, there is no "right" or "wrong" way to do it, as long as you are not hurting yourself, or anyone else intentionally, in the process of doing. These video are listed on "The Hoopment" playlist on YouTube, along with videos of me practicing Hoopment, if you would like to get more ideas of different ways of practicing allowing the hoop to move you. 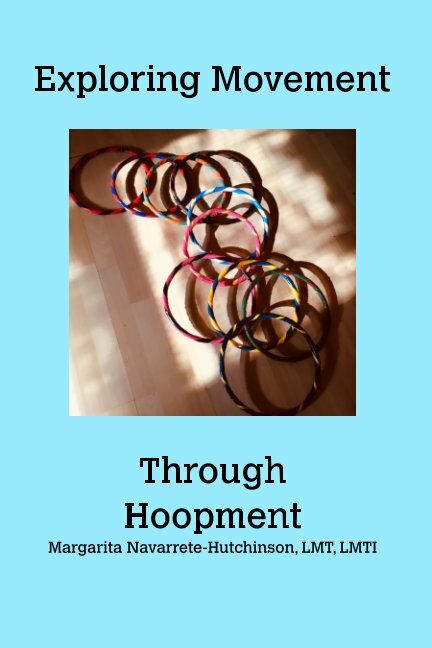 Below is a free pdf version of Exploring Movement Through Hoopment, which is available for purchase through blurb.com. If Hoopment has helped you, and you would like to show your gratitude, please buy a book!